It would be a bit much to try to make some kind of Easter metaphor, but some time within the final 24 hours of the Kickstarter, Channel A hit its funding goal of $10,000. It wasn’t looking good for a while there, but things really turned around when the creator of Superfight!, another promising party game (there wound up being like four party games kickstarted at the same time), was kind enough to give a shout-out to Channel A to his 1,200+ backers. It’s normal for a Kickstarter to lag in the middle and pick up towards the end, but the difference before and after that Superfight! update is night and day, so that game’s team has my gratitude. That Asmadi Games added some new reward levels with some promotional items and such from their prior titles definitely helped us ride off of that boost, as did some targeted promotion. I’m really grateful to everyone who made it happen. To everyone who pledged, to the people around the world who pledged despite paying insane amounts for shipping, to all the friends and family who pledged to support me, to all the friends who helped playtest the game and make it as good as it is, to Chris Cieslik for publishing and believing in the game in the first place, to Mike Stevens (my RPG publishing partner in crime) who did such a great job demoing it, to Clay for making the game look just gorgeous, to Dawn for providing great art and signing up to do even more for our Director’s Pack backers, to everyone who helped spread the word on Twitter/Tumblr/Facebook/G+/forums/blogs/etc., and I’m sure I’m leaving someone out but you get the idea. Some people pledged simply because they came across a game that they felt they’d enjoy. Some people because they’ve enjoyed Asmadi Games’ other offerings. Some were my friends and family and other people supporting the game on general principle even if they might not play it much. A few people said they were fans of my work, which to me is the most amazing thing. I’ve been making and posting gaming stuff for ages now, and it seems like I’m finally hitting critical mass and getting somewhere. I mean, I made a game that got over $10,000 in Kickstarter pledges, and there were actually a few people to whom my weirdly pronounced name was a selling point. I can’t even wrap my head around that, and I guess mostly I’m just glad people are enjoying this stuff I make. Of course, this is an important milestone for Channel A, but it’s more a beginning than anything. Chris is aiming to have the first production run of the game ready in time to sell at Anime Boston (and if things work out I may be able to sell it at FanimeCon, which is that same weekend), which will mark the beginning of the convention season, during which Asmadi Games will be aggressively promoting the game. It’ll also be going into retail distribution, so I’m looking forward to seeing it show up at local game stores. And of course there’s the matter of getting into working on expansions, for which I already have far too many ideas. With this, and the Yaruki Zero book, and the Golden Sky Stories Kickstarter coming up terrifyingly fast, I think I’m going to remember 2013 as the year that all my messing around with making games finally bore fruit, the year things really began. I’ve got some really, really big news. Channel A has a publisher! Specifically, Asmadi Games, which is probably best known for We Didn’t Playtest This At All, but has put out a number of other games, including 2010 Golden Geek Award winner Innovation. 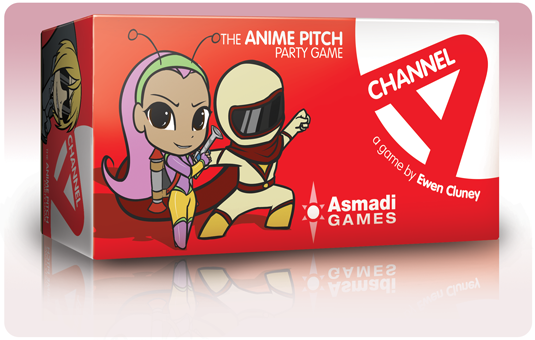 It’s difficult to find a publisher willing to take on a project in general, and there aren’t too many board game publishers that really know anime either, but Chris Cieslik (the main guy behind Asmadi) has been great to work with and gets what I’m trying to do with Channel A. (The publisher of Whack a Catgirl definitely knows more about anime than your average board game publisher.) He’s also highly dedicated, and you can expect to see him and his cohorts from Foam Brain Games offering Channel A at quite a few conventions. 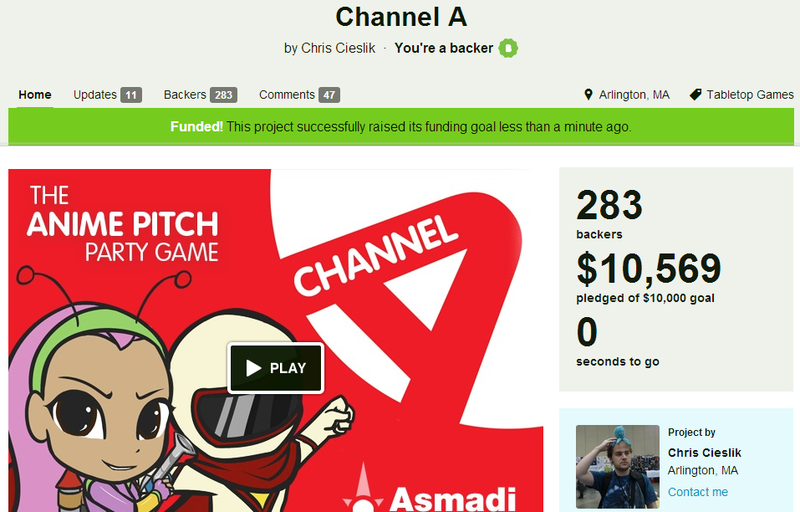 Asmadi has just launched a Kickstarter to fund Channel A too! The base goal is $10,000 to cover an initial print run, but we’ve got a bunch of bonuses and stretch goals lined up. Also, if you’d like to try a demo before the Kickstarter ends, Chris & co. will be at TotalCon, Genericon, MomoCon, WPI Gaming Weekend, and PAX East running demos. If you’d just like a quick look at what the game is like, the Kickstarter video does an excellent job of showing a typical round of Channel A. The new “TV Series Edition” of Channel A will feature new title cards and premise cards, a spiffy box that actually fits the cards properly, and a total of 300 cards (maybe more depending on stretch goals and such), all for a mere $25. Chris managed to innovate a new scoring system that doesn’t require voting cards (see the video for a demonstration), so this new version will feature additional premise cards and title cards. Clay Gardner is updating the look of the game too, so you can expect the kind of slick design work he’s provided for Minion Games products like The Manhattan Project and Tahiti (not to mention his excellent layout work for Golden Sky Stories). The Kickstarter features some other goodies, including buttons, custom chibi characters, and the chance to get a custom fake DVD case for your own made-up anime series, complete with a theme song! This also means that I’ll be discontinuing the “OAV Edition” from The Game Crafter. It was always meant to be an interim thing until I did exactly what we’re doing now, though needless to say I’m grateful to the six people who bought it. The free Manga Edition will still be available, though it will continue to be a basic, no-frills version of the game.